As seen in previous years, Congress is facing a Sept. 30 deadline to fund the government while appropriators struggle to work out their differences on fiscal year 2019 spending. There are only 11 legislative days this month when the House and Senate are both scheduled to be in session. Thus, there is not much floor time in either chamber to vote on what could be as many as three conference reports with spending totaling more than $1 trillion, even if the legislation is privileged in the Senate and the House limits debate. Over the next several weeks, many senators will be trying to convince their House colleagues to drop policy language objectionable to Democrats. House Republicans, meanwhile, will need to keep the spending bills conservative enough to appeal to their members. Republican lawmakers have mostly supported the five non-defense spending bills brought to the House floor, in part, because House appropriators added conservative policy language to the legislation. But those provisions will likely be stripped out during conference negotiations to ensure the bills can pass the Senate, where Democrats are needed to advance legislation. 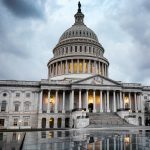 Even with the Senate’s leadership focused on the process, key appropriators are not sure how many of the 12 bills can become law before the fiscal year ends and midterm elections fever takes over Washington, DC. First, appropriators must shuffle money between the 12 bills to account for differences between the House and Senate versions without exceeding the $1.244 trillion discretionary spending cap set in the budget law. House leadership must decide how it wants to handle the Agriculture, Labor-HHS-Education and Transportation-HUD spending bills, which have passed the Senate and are being pre-conferenced, despite not having come to the House floor. Senate Appropriations Chairman Richard Shelby (R-Ala.), said he hoped to finalize a bicameral agreement this week for their first “minibus,” H.R. 5895, which would fund federal energy, veterans and military construction programs, as well as Congress’ own operations. However, with many outstanding policy issues remaining, it is unlikely that meeting will happen this week or that a final conference agreement would be ready. Appropriators are also focused on getting the Defense spending bill enacted before the new fiscal year begins. But neither Sen. Shelby, who also chairs the Defense subcommittee, nor Defense Appropriations Ranking Member Richard Durbin (D-Ill.), are willing to say if negotiations will finish in time. Meanwhile, Senate Financial Services Appropriations Chairman James Lankford (R-Okla.), is more confident negotiations on his portion of the Agriculture, Financial Services, Interior-Environment and Transportation — HUD spending package (HR 6147) will wrap up before the end of September.